October and November are second only to May and June in terms of the amount there is to do in our garden. All four months are key for preparation and planting. 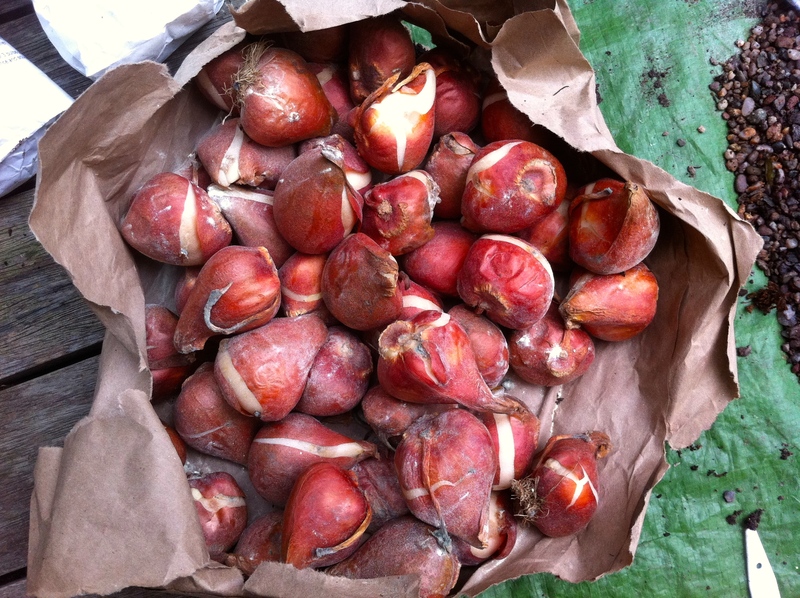 In the spring it’s all about tender perennials, flashy annuals and plump dahlia tubers, but in autumn the focus is on those dry, paper-coated time bombs we call bulbs. They arrive as crisp and tanned as David Dickinson in September, giving few clues as to the incredible flower power packed inside. I’ve been secreting them lovingly in containers since then, revelling in the prospect of bold new varieties and startling colour combinations. Every clement moment during my weekends is spent emptying and cleaning terracotta pots, mixing compost and getting those bulbs snuggly beneath a protective blanket of grit and loam. I always overbuy horribly (my eyes are bigger than my garden….and my wallet for that matter), so the task can sometimes feel repetitive and unrelenting. However, I know that in spring I will be richly rewarded. 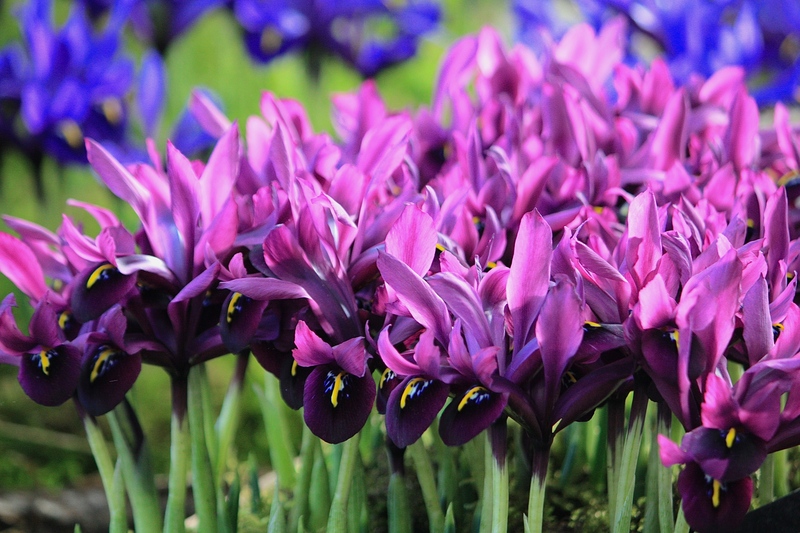 Narcissi, irises and crocuses, which like to get their roots established early, take priority in September, with tulips perfectly happy planted well into November once the weather gets colder. Prepared narcissi, such as N. ‘Paperwhite Ziva’, N. ‘Cragford’ and N. ‘Avalanche’ are saved until last, otherwise they’re in bloom too soon before Christmas. In storage moisture is bulbs’ greatest enemy, so I keep them waiting in a cool, dry place and check regularly for signs of bluish mould or unhealthy mottling. I avoid leaving them stacked in plastic bags or packed in transit boxes where they might sweat. If found, a dusting of sulphur puts a stop to any minor outbreaks of rot. The best prevention is to get them in the ground or into pots quickly. Even if the task does drive me potty, I know I’ll be glad I persevered in five months’ time. Good for you. You are so industrious. I was happy to have gotten my pots washed yesterday, but haven’t gotten anything potted up. Once a gardener, always a gardener Jack! I am glad the viewings have picked up and hope you get a good offer. Now must be a great time to show everyone around with summer arriving (or arrived!). I recently found your blog and have been enjoying it very much. My eyes were much bigger than my pocket book or my back this year. When the bulbs went on sale I ordered, then ordered again, then once again. I have planted over 3000 bulbs this fall between my little house in town, our cottage on the Bruce Peninsula (Ontario Canada), and my daughter’s school. In 2016 I am planning on visiting Kent. So far on my list is Sissinghurst (of course), Great Dixter, and Gravetye Manor incorporated with lunch or tea. I would love some suggestions to narrow down the enormous selection. My mother has decided that she will join me, although I am more of the gardener. I’m glad I am not alone in my bulbophilia! Sissinghurst and Dixter are very close to one another so can be seen in one day. I can also recommend Goodnestone Park and The Salutation in East Kent, but if you are more on the East Sussex side there’s West Dean, Perch Hill (Sarah Raven) and Pashley Manor to name but a few. You will have to make choices unless you want to stay all summer long. I think you have three of the best there, but be warned, you won’t get them to yourself! Thank you for the recommendations! We will only be there a week unfortunately, so yes I am trying to choose very wisely. And I don’t want to make it a flurry and not remember any of it either. I am assuming that we will need to rent a vehicle. Do you have any suggestions on accommodation that is “cheap and cheerful”?